The bridge was designed to withstand a Category 5 hurricane, the most dangerous measure by the National Hurricane Center. 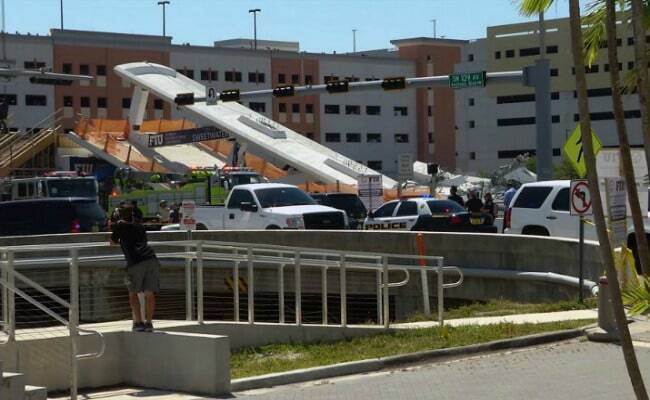 A new pedestrian walkway that collapsed onto traffic at Florida International University on Thursday, killing several people, was erected in only six hours using a technique called "Accelerated Bridge Construction," according to the school. The bridge was designed to withstand a Category 5 hurricane, the most dangerous measure by the National Hurricane Center, and last 100 years, according to the university. To keep the disruption of traffic to a minimum, a 174-foot (53-meter) portion of the bridge was built adjacent to the street and was driven into its perpendicular position across the road by a rig in only six hours on Saturday, according to the university. Accelerated Bridge Construction, or ABC, is a technique in which bridges can be replaced in 48 to 72 hours, reducing planning and work time by years and cutting traffic delays. Accelerated Bridge Construction uses different methods, designs and materials that are intended to produce safer, more durable bridges with longer service lives than conventional bridges, according to the U.S. Department of Transportation and Federal Highway Administration. The three leading ABC technologies being promoted under the Federal Highway Administration's "Every Day Counts" initiative include Prefabricated Bridge Elements and Systems, Slide-In Bridge Construction, and Geosynthetic Reinforced Soil - Integrated Bridge System (GRS-IBS). * Funding for the $14.2 million bridge is part of a $19.4 million U.S. Transportation Department grant through the Transportation Investment Generating Economic Recovery (TIGER) program, according to the university. * The bridge was the first in the world to be constructed entirely of self-cleaning concrete, according to the university. Titanium dioxide used in its construction, when exposed to sunlight, captures air pollutants and keeps the surface white.